There was a lot of love for the new Nokia 3310 last year, but none of that came from the US, where the 2.5G phone didn't work on American networks. Enter the Nokia 3310 3G. It's the faster version of the retro phone, and it works with GSM carriers, meaning AT&T and T-Mobile (but not Verizon and Sprint). That's great news if you want a long-lasting, durable phone that doesn't cost a lot and, maybe most importantly, plays Snake 2 on its 2.4-inch color screen. Nokia 3310 3G price in the US is $59.99, which is cheaper than any Android phone you'll find on sale, outside of a few Amazon Prime phone deals. It's already out in Australia for AU$89.95, as it was first announced there, and it's now available in the UK for £59.99 SIM-free, slightly up from the 2.5G version. The official US release date is October 29, however, you can pre-order the phone right now through Best Buy. It's available in four colors: azure (blue), yellow, warm Red, and charcoal (dark gray). 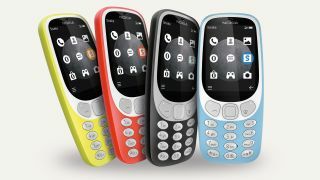 Note: the Nokia 3310 3G battery won't last long as the 2.5G version due to that power-hungry 3G radio. It's standby time is still 27 days, but music playback is 40 hours and talk time is down to 6.5 hours. So who's it for? It can act as a safe phone choice for traveling since it's so cheap, or a weekend-long concert since it's durable and lasts longer than a smartphone. Or it's the ideal burner phone for your totally legit business.